It’s Saturday and I’m back in Paris at last. The scaffolding has been removed from our windows so we decide to replace some of our house plants because I’m not the only one to have suffered from Seasonal Affective Disorder. We go down our four flights of stairs with the shopping trolley and discover it’s spitting. Neither of us wants to walk back up for an umbrella. I have a hood and Relationnel has a hat. That will have to do. We walk down Rue de Rivoli to the end of the Louvre then turn right towards Quai de la Megisserie. On our left we see a brass band and some sort of stall being set up in front of the Town Hall. It looks as though the neighbourhood association (1er arrondissement) is going to be handing out galettes des rois. If you don’t know what they are, you can read my last year’s post, Galette des Rois – King’s Cake. We decide we’ll check in on the way back, despite my diet. It’s winter of course so most of the traditional pet and plant shops don’t have much out on the pavement and the largest, Vilmorin, is closed for renovation. Relationnel wants to find a new fern to replace the one he loves best which I think is a fishbone fern. 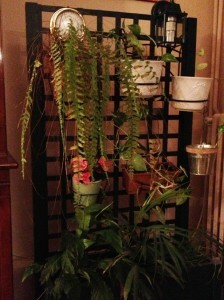 We also need a bird’s nest fern and at least one other plant. None of the stores has a fishbone but we buy a bird’s nest and another plant at Casa Nova and Relationnel sees two little maidenhairs that he wants. I object because, in my experience, they keel over within weeks of buying them. He insists however so we get them. We decide to go and get the car and go to Truffaut, an enormous nursery on the other side of town. 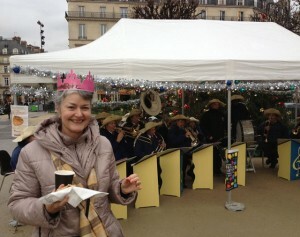 We go past the Town Hall again and there are lots of people eating galette and drinking cider and hot chocolate while the band is playing a catchy tune in the background. 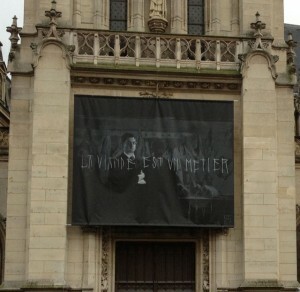 There’s a big banner up on the Town Hall that mysteriously says “La viande est un métier” (Meat is a profession). I nearly crack my tooth on the fève, which is a tiny red handbag of all things. I go and claim my reversible crown (Reine on one side and Roi on the other which I’ve never seen before!). A lady comes up to me and asks to see my fève obviously very sad she didn’t get one herself but I don’t hand it over because I want to add it to my collection. We move off and go past a bag and luggage store which is having its after-Christmas sales and buy a suitcase with four wheels to replace the one that disappeared on our way back from Australia, plus a cabin bag to match. I’ve been wanting a four-wheel model for a while. I love the way people just glide them effortlessly along the ground. We chose dark red so the suitcase will stand out better than black on the carousel and not get pinched again. 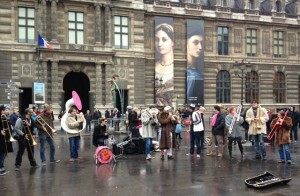 As we reach Place du Palais Royal, just opposite the Louvre, we hear more music. It’s a jazz band this time with a big pink and white tuba. They’re all clowing around and enjoying themselves. The classical orchestra that is often on nearby Place Colette hasn’t made an appearance. I guess they were put off by the rain which fortunately has ceased. At Truffaut, there is a still no fishbone fern, so Relationnel very reluctantly settles for another kind instead. I promise to cut the old one right back and see if some TLC and a lot of light (in my office) will revive it. We get home and replace all the dead plants, taking particular care when replanting the maidenhairs. I’ll let you know how long I manage to keep them alive! This entry was posted in Flowers & gardens, Paris and tagged ferns, galette des rois, houseplants, quai de la Mégisserie, SAD, Seasonal Affective Disorder. Bookmark the permalink. When your maidenhairs die because the atmosphere isn’t humid enough, replace them with any of the asplenium species that take your fancy — native spleenwort and harts tongue, or various cultivars. They’re tough and attractive. 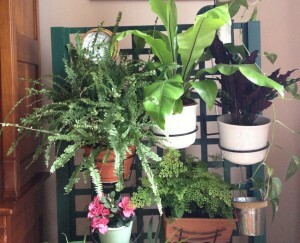 I love ferns, but only grow the hardy ones, outdoors. Sadly, very few proved hardy enough to survive last winter. I was gutted, because most of them had been a gift from someone who is now gone and I miss his advice — he was a fantastic plantsman. When I read your comment, I went off to spray the maidenhair! I usually do well with indoor plants (I have another lot that I’ve had for about 20 years now and which are doing marvellously) because I tend to stick with more hardy ones. The other one we bought is some sort of spotted fern that closes up at night, to our surprise. It’s very sad about your ferns though. We have lots of outdoor ones in Blois (the hardy type). I love them. We did a couple weeks in Italy, and I desperately wanted to get to France but just didn’t have the time. 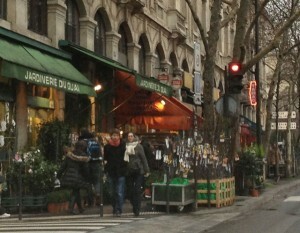 Love looking at these bits of life in Paris! Hi Jess and thanks for commenting. What a pity you didn’t get to France, but Italy is lovely too.